The remnant can be seen in visible light with amateur telescopes, starting with 9.25-inch instruments with filters. It can also be observed in infrared and X-ray wavelengths and appears as a ring of expanding material about 5 arcminutes across. 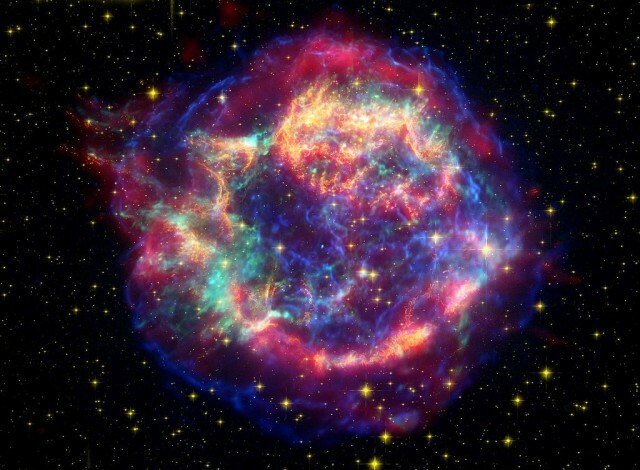 Cassiopeia A is the remnant of a supernova that first became visible from Earth about 300 years ago. There are no recorded sightings of the supernova event, likely due to its light having been absorbed by interstellar dust. The supernova, however, may have been recorded by the English astronomer John Flamsteed, who noted a sixth magnitude star on August 16, 1680 and recorded it as 3 Cassiopeiae. 3 Cassiopeiae is a hypothethical star, one that doesn’t correspond to any star observed today. Its position, as given by Flamsteed, is within 10 arcminutes of the Cas A radio source. Another possible explanation for no recorded sightings of the progenitor supernova is that the progenitor star was exceptionally massive and had ejected much of its outer layers before exploding. 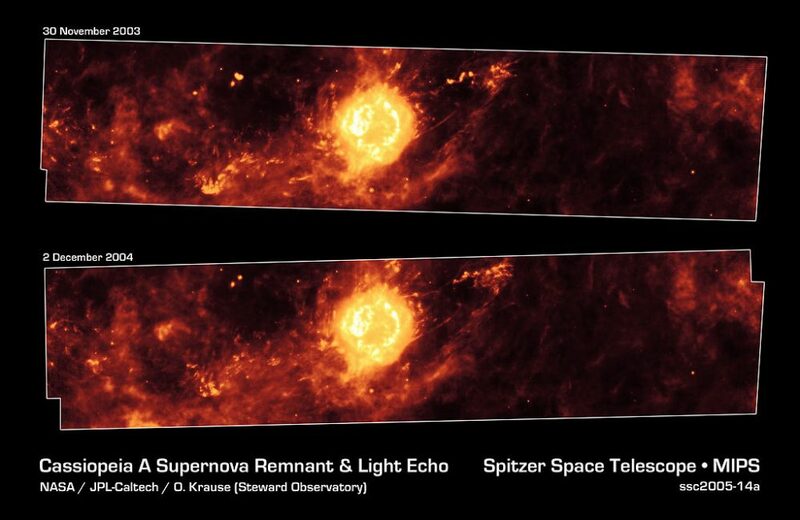 The clouds of expelled material would have cloaked the light of the supernova event. The progenitor star had an estimated mass 15 to 20 times that of the Sun. The remnant’s expansion shell has an estimated temperature of 50 million degrees Fahrenheit and is expanding at 4,000 to 6,000 km/s. It will keep expanding for thousands of years. This composite shows the Cassiopeia A supernova remnant across the spectrum: Gamma rays (magenta) from NASA’s Fermi Gamma-ray Space Telescope; X-rays (blue, green) from NASA’s Chandra X-ray Observatory; visible light (yellow) from the Hubble Space Telescope; infrared (red) from NASA’s Spitzer Space Telescope; and radio (orange) from the Very Large Array near Socorro, N.M. Credit: NASA/DOE/Fermi LAT Collaboration, CXC/SAO/JPL-Caltech/Steward/O. Krause et al., and NRAO/AUI. Cassiopeia A was discovered in 1947 by radio astronomers from Cambridge, England. It was one of the first discrete radio sources to be detected. The optical component of the remnant was first discovered in 1950. The central star of Cassiopeia A is a neutron star. It was the first neutron star detected to have a carbon atmosphere. In 2011, astronomers discovered that the star was rapidly cooling. 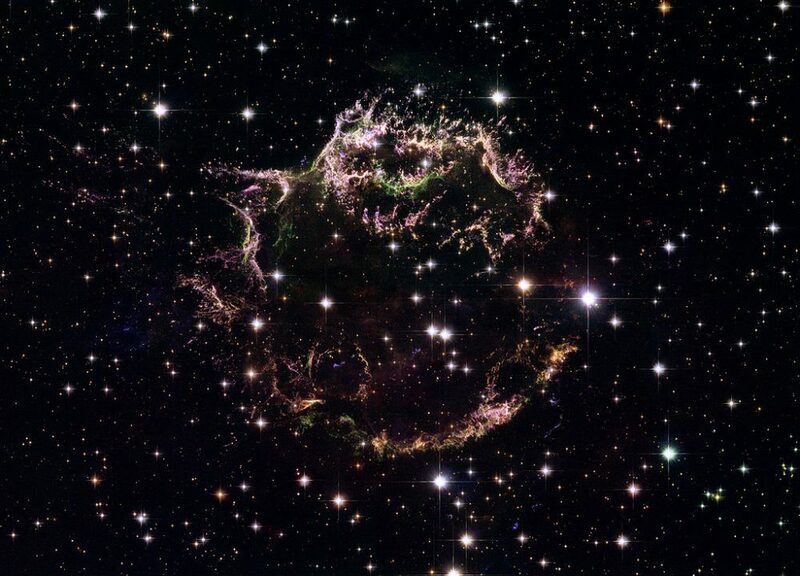 Cassiopeia A is catalogued as 3C 461 in the Third Cambridge Catalogue of Radio Sources and as G111.7-2.1 in the Green Catalog of Supernova Remnants. Cassiopeia A is the brightest extrasolar radio source in the sky at frequencies above 1 GHz. At frequencies below 1 GHz, it is not as intense as Cygnus A, a radio galaxy located in the constellation Cygnus. Phosphorus was reported to have been detected in Cassiopeia A in 2013, confirming that the element is indeed produced in supernova explosions. The phosphorus-iron ratio was up to 100 times higher in the material from the remnant than in the host galaxy (the Milky Way) in general. 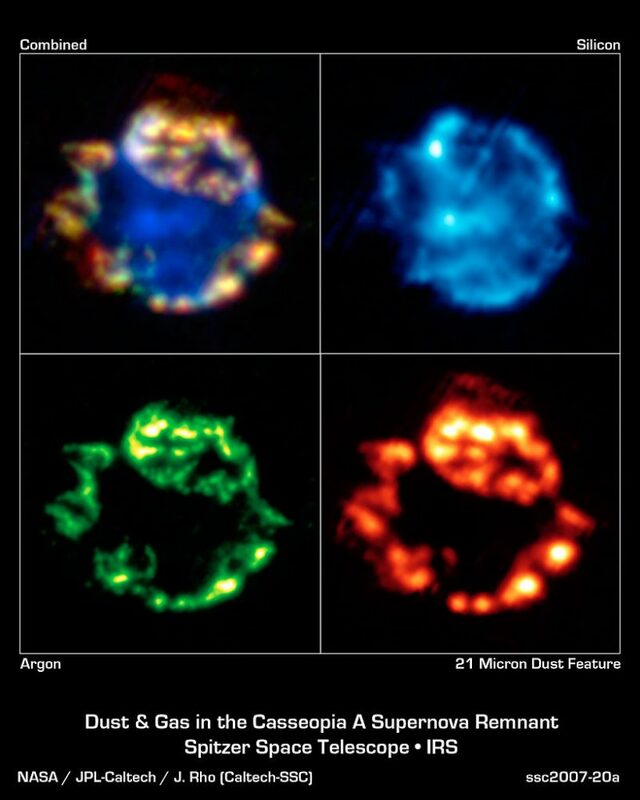 Cassiopeia A was the only supernova remnant to be modelled in 3D and the only deep sky object to be included in the Smithsonian 3D project. In 2015, Harvard-Smithsonian and Dartmouth College astronomers created an interactive 3D map of the remnant’s interior and discovered that it was composed of about a half dozen bubble-like cavities. The large, massive cavities appear as a Swiss cheese-like structure and are associated with the rings of debris that form the bright outer shell of Cassiopeia A. The two most well defined of these bubbles are 3 and 6 light years across. Cassiopeia A is a remnant of a Type IIb supernova, one caused by an internal collapse of a massive star. 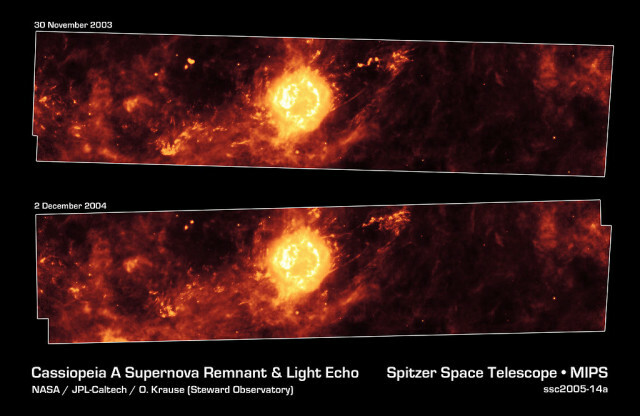 Infrared observations with the Spitzer Space Telescope showed that the spectrum of the remnant indicated a supernova of this type. The progenitor star was likely a red supergiant with a helium core that had lost most of its hydrogen envelope. 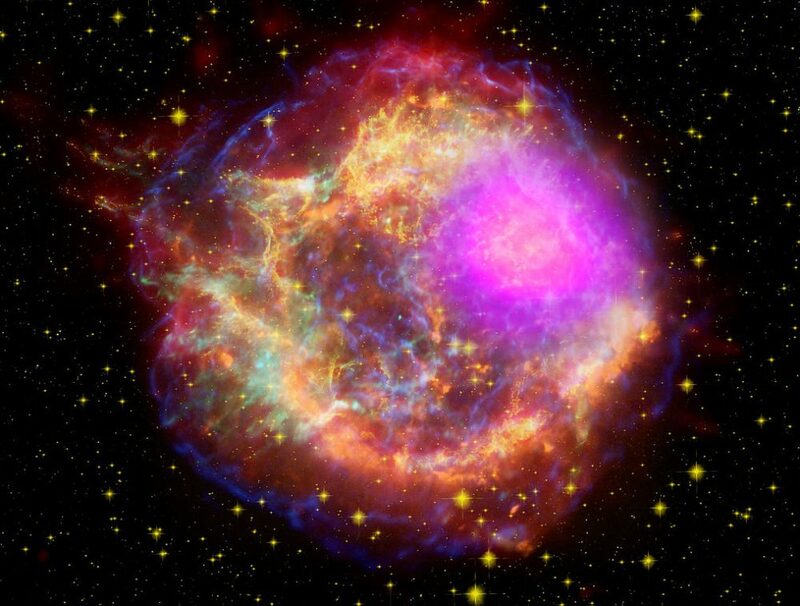 Calculations using the observed expansion rate of the remnant pointed to 1667 as the year the light from the supernova explosion first reached Earth. However, observations with the Hubble Space Telescope have revealed that remnants were not expanding in a uniform manner, with the highest velocities observed in two opposing jets. The light from the progenitor supernova of Cassiopeia A is believed to have first reached Earth at some point between 1662 and 1700.